When it comes down to it, every type of inground swimming pool has its share of problems. Vinyl liner pools are very temporary, fiberglass pools have size/depth restrictions, and concrete pools have their drawbacks as well. In this article, though, I’m going to point out some problems with concrete pools you may not have considered before. These are things you should clearly know before moving forward with your inground pool purchase. Many new pool buyers have no idea they’re going to have to resurface their concrete pool in the future. It is for this exact reason that companies might give you a “lifetime structure warranty,” but this does NOT apply to the finish of the pool. You need to get, IN WRITING, the surface warranty of your concrete pool before it’s ever built. This goes in line with #1. Many folks don’t realize this, but concrete surfaces are quite susceptible to wear and tear when exposed to salt. Because of this issue, and the fact that saltwater pools have become popular around the world, you must understand that if you do use a salt chlorine generator on your concrete pool, you’re going to have to resurface it even sooner than you previously anticipated. If you’ve ever tried playing volleyball in a concrete swimming pool without water shoes on, you know exactly what I mean when I say concrete pools are rough. In fact, the older they get, the rougher they get—and bloody toes and feet are commonplace in these pools as the roughness increases. Without question, concrete pools require the most maintenance of any type of inground pool. For example, with vinyl and fiberglass pools you don’t have to worry so much about your calcium levels in the water. However, this is a must with a concrete pool. The water will leach calcium out of the surface of the pool if there is not enough calcium in the water—which causes further pitting, roughness, etc. Along with this, you need to brush concrete/gunite pools more often, and you have to pay close attention to the pH. Acid washings during the offseason are also not at all uncommon. 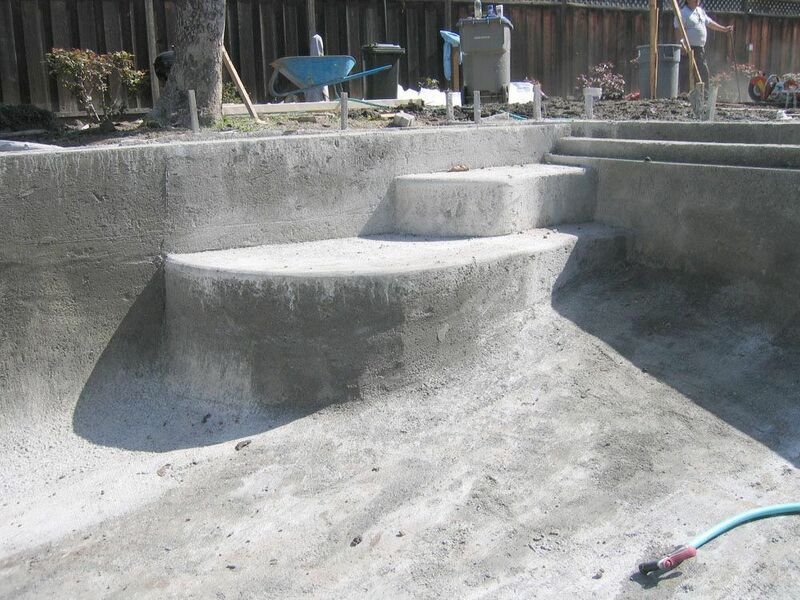 Installing a concrete pool will often take months. I’m sure you’ve heard the horror stories from your friends or neighbors that couldn’t seem to get their pool finished due to weather, workmanship issues, etc. If you’re going to have a concrete pool installed in your yard, you should consider getting in writing just how long the pool “should” take to install. So there are 5 problems with concrete pools you may want to consider as you go about your pool-buying decision. Despite these problems, though, concrete does have its benefits. With its design flexibility, you have unlimited potential as to what type of creation you can achieve for your backyard swimming pool oasis. Questions? Comments? Don’t hesitate to leave your thoughts below! For more information on different types of inground pools available, you can download our free ebook, "Comparing Fiberglass, Concrete, and Vinyl Liner Pools in the Modern Age" for a comprehensive comparison of your options.